Jesus had about three years to mold a dozen fearful and faithless men into the pillars of worldwide movement. But Jesus had one advantage a he made his choice. He knew that the time they spent with him would have a transforming effect on each of these men. 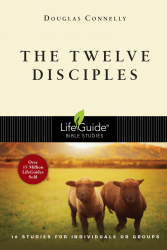 This study of Jesus' followers will change you too! You will discover that the Master is still in the business of transforming lives. He can take the most fear-filled and faithless among us and empower us to be confident witnesses of his grace and forgiveness.